Tacos filled with fresh fish are eaten all along the Baja coast. In San Felipe, a small seaside town in Baja, California, every restaurant along the malecon (the waterfront and the center of town) serves this type of fish, battered and fried. And you’d be silly not to try some if you’re there. But you don’t have to go all the way down to the Gulf of California to enjoy a taste of the ocean. 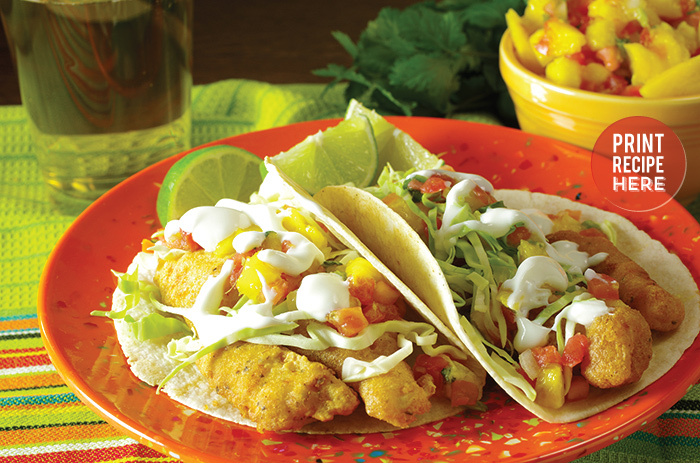 I’ve created a recipe for you so that you can enjoy your own bit of deliciousness-Baja style. Cervezas and limes are optional. 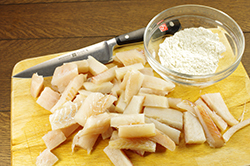 Cut the fish into 10 strips, 2 to 3 inches long. Dust the fish with 1/4 cup of the flour until completely coated. In a medium bowl, combine the beer, egg yolk, oregano, black pepper, chili powder, and the remaining 1/2 cup flour until well mixed. 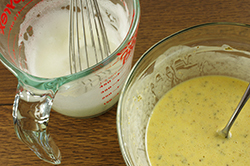 In a separate small bowl, whisk the egg white until small peaks form. Gently fold it into the batter. In a large saucepan of skillet with high sides, heat about 1 inch of vegetable oil to 350°F. 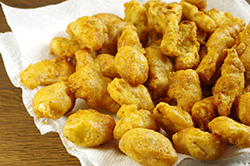 Dredge the fish pieces in the batter, then fry them until golden on both sides, 6 to 8 minutes total, turning to make sure they brown evenly. 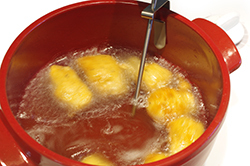 Remove from the oil to drain on a paper towel-lined plate. Repeat until all the fish is cooked. Stack the tortillas on a small microwave-safe plate and cover with a wet paper towel. Microwave on high for 30 to 60 seconds, until soft. Put 2 tortillas on each of 5 plates. 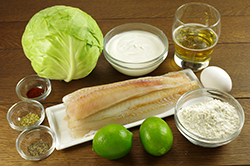 Place a piece of fish in each tortilla and top each with a spoonful of crema, a handful of shredded cabbage, and salsa, if you wish. Serve immediately with a couple of lime wedges.